AHF issues statement in reaction to political crisis over Gyurcsany "Pinnochio Gate" speech. AHF announces calendar of 1956 national commemorative events that includes a Grand Gala at Washington's Historic Cosmos Club! President Bush may visit Hungary for 1956 Revolution Anniversary. Last year, AHF sent letter urging the White House to postpone any such visit until after Hungarian elections. 1956 Resolutions adopted in Virginia, Texas, Maryland, Ohio and Colorado - with others in the works! How can you help with our National 1956 Resolution Efforts? 1956 National Memorial Statue in the Nation's Capital - AHF needs your support. NJ: American Hungarian Foundation exhibiting Balazs Szabo through October 1st. FL: The American Foundation for Hungarian Youth and Culture - 1956 Memorial Statue unveiling at Collier County Government Campus on December 3rd! OH: Bela Bognar's Scholarship Fund supporting ethnic Hungarians. Support them! MA: Exhibition on 1956 Hungarian Revolution in downtown Boston's Prudential Center. 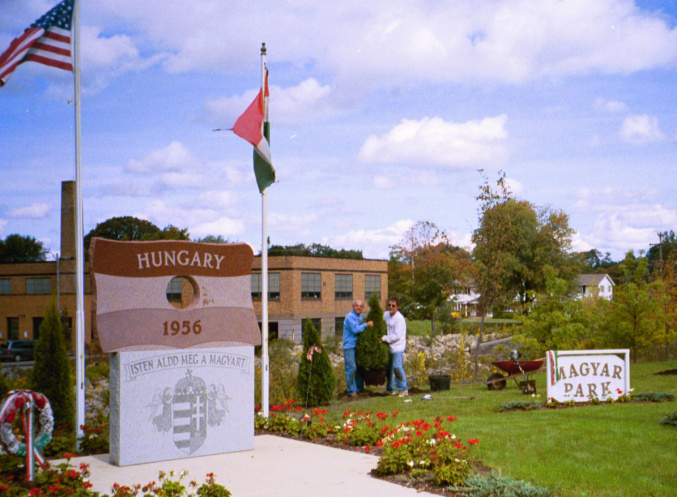 The Massachusetts Hungarians are making plans for other 1956 commemorations - volunteer! AHF / Amazon Store: New Books Posted! A demokrácia egyik alapelve, hogy a szavazók szavazó urnákon keresztül gyakorolják a közhatalmat. Ezt mind a gyozteseknek, mind pedig a veszteseknek tiszteletben kell tartaniuk. Bár a szólasszabadság, beleértve a békés tüntetést is, része a demokráciának, a rendbontás és eroszak nem. De a provokálás sem. Az érem másik oldala, hogy akik megnyerik a szavazópolgárok bizalmát, azok tisztességgel, becsültettel és legjobb tudásukkal szolgálják a nemzet és az ország érdekeit. Mivel a Gyurcsány-kormány bevalotta, hogy nem csak, hogy hazudott, de gazdaságilag is sokat rontott az ország helyzetén, ezért nyilvánvalóvá vált, hogy visszaélt azzal a bizalommal, amellyel a választók felruházták. - ifj. Koszorús Ferenc, Társelnök, Washington, D.C.
6/16/2006 - AHF outlines key issues in Open Letter/Nyílt Levél to Hungarian Prime Minister Gyurcsány (in English and Hungarian). The Federation decided to publish this letter because it has watched with growing concern how the Medgyessy / Gyurcsany governments ignored or failed to adequately address several key issues – economic reforms, support for families, aspirations of Hungarian minorities in countries neighboring Hungary and voting rights. Continuing News: AHF continues call for support of a 1956 Statue for the Nation's Capital...AHF's 1956 Commemoration Committee is seeking your help to erect a statue in Washington, D.C. devoted to the heroes of the Hungarian Revolution. The AHF plan calls for an actual-size statue to be placed prominently in Washington while we raise funds for its bronze replacement. Seen here with his prototype design is renowned sculptor Gyuri Hollosy, who was responsible for the Boston Liberty Square memorial. At the recent Capitol Reception honoring 1848, Congressman Tom Lantos mentioned his intent to place a 1956 memorial in Washington. We must ensure this remarkable design is selected! Contact bryandawson@americanhungarianfederation.org and join the 1956 Commemoration Committee! New Video posted to the 1956 Portal! "News Magazine of the Screen" presented "Flight from Hungary" in early 1957 featuring video taken after the brutal Soviet re-occupation. "This is battered Budapest under the brutal Russian boot, Soviet tanks roam the streets under the ruins they laid as communist secret police hunt down heroic Freedom Fighters. 25,000 Hungarians are dead." A fascinating video, it also includes news about the Suez Crisis and more glimpes into life during this time. Can't see this in full color? This is a fine opportunity to commemorate one of the greatest events of the 20th century in a setting worthy of the occassion of the 50th Anniversaryu of the Hungarian Revolution. 1956 Symposium, Film Screenings and Ceremony in honor of 1956. Pianist and composer Laszlo Gardony has been recognized worldwide for his extraordinary musicianship and is known as a "Hungarian Rhapsodist." He has released six albums, has toured in 22 countries, won numerous awards, and appeared on television and radio programs throughout the world. In 1987, Laszlo won First Prize at The Great American Jazz Piano Competition. JazzTimes has called him "one of contemporary music's truly original voices." [Featured Members] or visit his official site on www.lgjazz.com. The American Hungarian Council of Lorain County officially dedicated its 1848-1956 Memorial Monument on Sept. 17, 2006 starting with a dedication ceremony at Oakwood Park. Hundreds gathered at attended a banquet in the social hall of the Hungarian Reformed Church. Dr. Gabor Garai, Honorary Hungarian Consul in Boston, is planning and exhibition that aims to educate the public about the 1956 Hungarian Revolution. The Prudential Center agreed to provide an well-trafficked area for the display. Planned is a photo exhibit and other artifacts./ A Magyar Köztársaság Boston-i Tiszteletbeli Konzulátusa nagyszabású ünnepségsorozatot szervez 2006. október 20. és 30.-a között az 1956-os Magyar Forradalom és Szabadságharc 50. évfordulója alkalmából. Az eseménysorozat egyik jelentõs állomása a Prudential Center Huntington Árkád, más néven Wintergarten részében tartandó egy hetes fotókiállítás, amelynek anyagát egyrészt a Washington-i Nagykövetség által felajánlott utazó-fotó kiállítás, másrészt a jólismert osztrák származású fotográfus Erich Lessing képei szinesítenek majd. The Boston Hungarians are also planning other events for the commemoration of 1956. They are calling for volunteers! Visit The Hungarian Society of Massachusetts for more information. Acclaimed Artist and Mexican Icon: One of the most influential artists of the middle twentieth century. She was born Magdalena Carmen Frida Kahlo y Calderón. Her father, Guillermo Kahlo, was a Jewish Hungarian immigrant photographer who had been born in Germany. Her mother, Matilde Calderon, was a Catholic Mexican whose origins were Spanish and Native American.